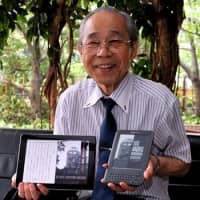 Takuma Fukuyama, 77, removes the red Smart Cover on his iPad 2, pushes the home button, taps an icon and then flicks and scrolls it until he arrives at the page he is looking for. He then pulls out a Kindle e-reader with a 6-inch screen and handles it with similar ease to bring up the same page as on his iPad. 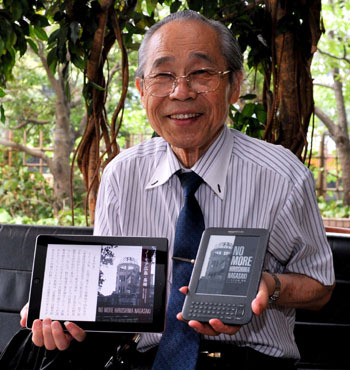 The high-tech gadgets display the cover of a digital book titled “No More Hiroshima Nagasaki,” a selection of wartime accounts translated into English that Fukuyama has collected over the last 24 years. Fukuyama, president of Osaka-based publisher Shimpu Shobo Co., decided this summer to sell his lifetime’s work online in a digital format. “This is an attempt to keep a record of our memories from the war,” Fukuyama said. Selling the book through Apple Inc.’s App Store and for Amazon.com’s Kindle e-reader is faster than traditional publishing and will allow it to reach a wider audience. “I felt that this was exactly what I needed to do,” Fukuyama said. Born in Kurayoshi, Tottori Prefecture, in 1934, Fukuyama was a fifth-grader at a local elementary school when the war ended in August 1945. “Kids were taught how to fight with bamboo spears” during classes, he recalled, adding that those who sketched the Imperial Japanese Army shooting down enemy planes during art lessons were highly praised by teachers. 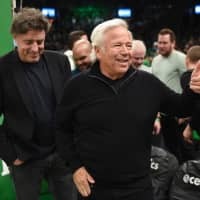 Overall, however, the septuagenarian said his recollections do not include wartime atrocities, and there weren’t major U.S. air raids where he lived. Life was more about being poor and constantly hungry, he said. After the war, Fukuyama attended a high school in Osaka and soon developed a strong interest in journalism. After graduating from high school he began working at an Osaka-based newspaper, and as a side project interviewed locals and wrote down their biographies. In 1988, Fukuyama, who at the time was lecturing on how to write autobiographies, began to assemble a collection of stories about wartime experiences written by his students. Two years later, he opened up his project and solicited memoirs from the public. Since then, the collection of memoirs has been published every August. Of the 16,158 memoirs submitted to Fukuyama’s project, 1,921 have been published in book form and will “live on for good,” he said. Each story recaps the tragedy of war and must be documented for future generations, he explained. “No More Hiroshima and Nagasaki,” which has been sold online in digital format by Amazon.com for $5.99 since Aug. 1, focuses on 37 victims of the nuclear bombings and their haunting tales. “Nagasaki Station was so crowded with people who gathered to see off the soldiers departing for the front . . . I parted from my family and sat still in the train, waiting for it to move,” Akira Sasao, who died in 2008 aged 71, recalled of the day he left for the Naval Academy in Nagasaki Prefecture at age 17. His memoir was included in the 1999 collection. “Suddenly at that moment, my mother appeared just under the window where I was looking out. With a tense smile on her face she stroked me on the cheek then turned around in a hurry and ran back. That occurred so suddenly that I could not say a word,” he wrote. The brief encounter was the last time the two ever saw each other, as his mother died in the Aug. 9 Nagasaki atomic bombing. Sasao later found out that she was carrying a photograph of him when she was killed. Tokiko Konishi, 86, also wrote about the Nagasaki bombing in the 2010 collection. Konishi was able to locate her mother near ground zero after the bomb was dropped but despite her horrific burns the hospitals could only give her a first-aid kit. She dipped her handkerchief in the nearby river and wiped her mother’s face, and after she passed away, an army officer helped to prepare the body for cremation by piling wood on her corpse, she wrote. Tissue papers were placed under her mother’s hair to start the fire. In preparing the memoirs for digital format, which includes both Sasao and Konishi’s stories, Fukuyama said the most difficult task was translating the stories into English. But he felt it was his duty to distribute the stories to a wider audience overseas, especially as there still are many who believe the atomic bombings were justified. “I originally thought of asking (Columbia University professor) Donald Keene to provide the translation,” Fukuyama said, explaining that he came to know him through exchanging letters more than a decade ago. After Keene, who is considered one of the leading experts in Japanese studies, told him he could not help due to scheduling conflicts, Fukuyama turned to English teachers in Hiroshima and Nagasaki for assistance. But the translation wasn’t an easy matter. For instance, “A ‘boukugo’ would be translated into ‘shelter,’ but the nuance is a bit different between the two,” Fukuyama said. Dealing with small details, such as changing units of measurement from the metric system, was also an arduous task. But recent developments concerning the abolition of nuclear weapons, led by U.S. President Barack Obama, provided him with the necessary motivation, he said. After U.S. Ambassador to Japan John Roos last year became the first U.S. representative to attend the ceremony marking the anniversary of the Hiroshima atomic bombing, Fukuyama said he felt the moment to act was now. The popularity of the iPad and the ability to distribute the wartime memoirs online were also major factors. “I began using computers when I turned 70,” Fukuyama said, adding he is certain that the technological advances will help his work to reach a new audience. 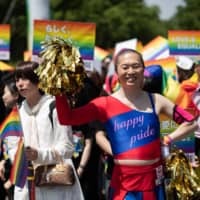 In terms of passing on his own experiences to the next generation, Fukuyama said he writes letters to his four grandchildren for them to read in the future, and depicts Japan’s modern history in as much detail as possible. “It is imperative that they understand how their privileged lives came to be,” he said. 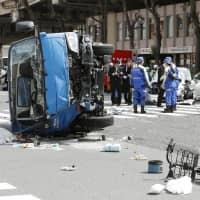 But while Fukuyama is firmly behind the abolition of nuclear weapons, he is not yet prepared to renounce the peaceful use of atomic energy following the March 11 Fukushima nuclear accident. “The whole country blindly bought the idea of nuclear power for peaceful use and we are paying the price,” Fukuyama said. “But while we need to abolish nuclear weapons, discussing nuclear-generated power in the same way is not right,” he added. Fukuyama said Japan must overcome the nuclear disaster and continue making technological advances. “Whatever the outcome is, we must be careful not to rely on extreme arguments. We need to really think this through,” he said.